Aspen Plan One - 4 Bedrooms, 2.5 Baths, 2,273 Square Feet with two and three car garage. Willow Plan Two - 4 -5 Bedrooms, 2.5 Baths, 2,433 Square Feet with two and three car garage. Evergreen Plan Three - 4 and 5 Bedrooms, 3 Baths, 2,698 Square Feet with two and three car garage. 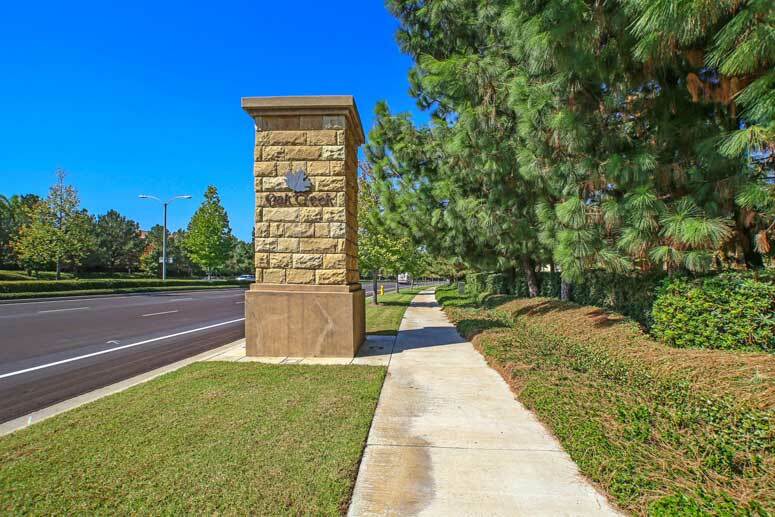 Walking and short driving distance to local number of Irvine Company owned and managed shopping centers. Amenities are great offering number of green parks, picnic tables, soccer fields, two Olympic size swimming pools and the famous Oak Creek Golf Course off of Irvine Center Dr.
Schools are among the Irvine award wining IUSD. Elementary school is Oak Creek Elementary School with 10 ranking located on 1 Dove Creek. Lakeside Middle School on 3 Lemongrass Irvine and Woodbridge High School on 2 Meadowbrook Irvine. The Master HOA to Oak Creek is Oak Creek Village Maintenance Association managed by Merit Property Management located on 1 Polaris Way Suite 100 Aliso Viejo CA 92656. They can be reached at 949.448.6000. Dues are approximately $56 per month. HOA Sub-association for Ashford Place is Ashford Place Maintenance Association managed by Keystone Pacific Property Management located on 16845 Von Karman Ave. Suite 200 Irvine CA 902606. They can be reached at 949-833-2600. HOA dues are $35 per month. So if looking to buy or lease at the Ashford Place then, please, have a look around, and contact us with any questions you might have about the market or our services. No question is too mundane - we want to help!